Help, I can't catch my new horse! I'm sorry to read that your experience with your new horse so far is not what I suspect you hoped for. Every behavior has a reason behind it. There will be factors in your horse's life that predisposed, initiated, and maintain the problem. Since you have only just purchased your horse you may never know all of these factors, but some may become apparent requiring you to adjust your approach, so be prepared to be flexible. The crux of the matter is that your mare is avoiding being caught, meaning she associates the process with something unpleasant, painful and possibly even downright fearful. By successfully evading capture your mare feels relief through negative reinforcement* and has learned to keep up this strategy. Negative reinforcement is the removal of something aversive to the horse as the direct consequence of a specific behaviour, which then happens more often in future. Essentially the horse's action makes the aversive go away, this is of benefit to the horse and so the action is repeated. In your horse's case that aversive could be previous bad experiences with her catcher, and now she thinks all people might repeat this (called a 'situational anxiety' because of what might happen in this specific situation). Alternatively it may be that what she thinks will happen after catching that is worrying her. For example working when in pain, or separation anxiety from being taken away from specific others (not uncommon in a newbie, especially if she is generally insecure or has been deprived of equine company). It's worth bearing in mind that just as moving house and divorce are two of the most stressful things a person can go through, moving home and herd, as well new people are major stressors in a horse's life, and happen without warning! This alone will make your mare more sensitive than usual. In any event, what happens after catching is in negative contrast to what goes before. You may find clues by thinking back to what your horse was used for previously, and in how she was kept and handled. Nothing is more frustrating to the new horse owner than to have a horse that refuses to be caught. As to what you should do, as well as thinking about what good things you could make happen as a result of being caught, such as a bucket feed near to her new horse friends, you need to consider what she wants most in the moment that you or whoever else catches her enters the field. The aim is to teach her good things about you. 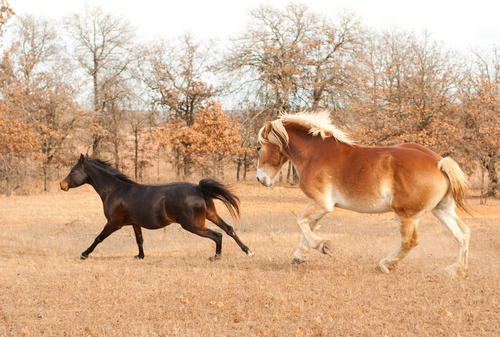 Since your mare is avoiding capture, it follows that what she wants most is for the catcher to go away. She currently makes this happen through all the strategies she has already shown you. Turn this state of affairs on its head and teach her approximations of behaviour incompatible with all her current strategies. Teach her a behaviour that is closer to being caught e.g. standing still, and make the consequence of that your (temporary) departure. Treat this first step as an experiment, beginning with carrying a halter and entering her enclosure. How close can you get before she moves away? Does she move away almost immediately? Or does she wait until a certain threshold distance? If she moves away immediately, casually hang around until she stops moving, then immediately leave the area. Repeating this a few times a day should teach your mare to keep still to make you leave. If she waits for you to get closer before moving away, go to just short of that distance, pause, and provided she keeps still, leave the area. Again this is teaching your mare to keep still to make you leave. When your mare has learned to keep still (she consistently repeats this level of performance), it's time to raise the stakes. When your mare is still, take half or one full step towards her before leaving. Aim to do this when she looks more relaxed in her keeping still performance as she will have more confidence in the behaviour. When this is successful, take progressively more steps towards her, but always leave before she does. The effect of this will be that she can predict and control your actions, reducing anxiety and increasing confidence. You will have achieved a good amount of 'systematic desensitisation' – teaching your horse to be more neutral about something she fears by re-introducing it in small, controllable doses. When you can get close, leave a small amount of good smelling food for her on the floor. (Avoid taking a bucket in if there are other horses present.) She'll smell the food and will be likely to approach and eat once you are safely retreating. But the link between your arrival and something good will be made! This is 'counter conditioning', teaching a new and opposite association and attitude. The final stage uses positive reinforcement: adding a reward as the consequence of a behaviour making it more likely in future. Once your mare appears to expect the food, wait and watch for any movement toward you. Reward any effort by leaving food and walking away until you mare is confident in her approach to you. Walking away is still important at this stage, your mare will be in two minds, to approach or to avoid. The dilemma could cause her original anxiety to flood back, so stick to predictable, feed and go. You will be able to build on this. Once she approaches you add the final steps, offering the halter or your hand for her to approach and sniff, when she does, remove your hand/halter and feed her a little. This will help her to feel like a participant and you can patiently move to haltering from here.